Over the years numerous people have worked to survey all the cemeteries in Fayette County. Joe Cole conducted his invaluable surveys in the late 1950's. Norman C. Krischke worked for many years on a series of booklets about Fayette County cemeteries which contain maps, census data, marriage dates, and information gleaned from obituaries and death certificates. Kathy Carter and members of her staff at the Fayette Heritage Museum & Archives have also personally surveyed numerous cemeteries over the years. Kathy has written short histories for many of the cemeteries and includes information from Joe Cole's early surveys and Judge Krischke's booklets, as well as her own research, in her reports. Most of those reports can be found through links below. The Fayette Heritage Archives and Museum have both vertical files and a computer database containing most burials in Fayette County. The staff will check their extensive cemetery database for you by e-mail. All you need is a surname. You do not need to know the name of the cemetery.There are a number of cemeteries that are known locally by more than one name. All known names are listed in the indexes below. The cemeteries with links will lead you to information about those cemeteries courtesy of the Fayette Heritage Archives and Museum, a photograph, and/or a link to a list of grave sites. If you have information about a cemetery, cemetery association contact data, or a photograph of a cemetery you'd like to contribute, please contact Rox Ann Johnson. 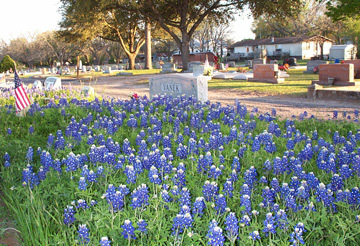 For questions about cemeteries, including laws, how to clean stones, and guidelines for restoring cemeteries, see Preserving Texas Cemeteries, a Texas Historical Commission publication that's available online. Locations of all cemeteries with links to more information about them. More data will be added soon. S. P. J. S. T.
Many, but not all of these cemeteries have Historic Texas Cemetery historical markers. Texas Historical Markers were placed in cemeteries before the Historic Texas designation was adopted.